The new V6 GT CPU cooler from Cooler Master is the first cooler we've had on our Intel i7 test system from Cooler Master and overall it scored very well in our testing. The V6 GT is following in the footsteps of other Cooler Master coolers such as the V8 and V10 CPU coolers that feature a "automotive" or "engine" design. The design of the V6 GT is nice and sleek but not over the top like some other coolers. The LED light on the top is customizable and you can choose from either Red, Blue or Purple lighting (or turn the LED lights off completely). The build quality of the V6 GT is very good and exactly what I expected from Cooler Master. 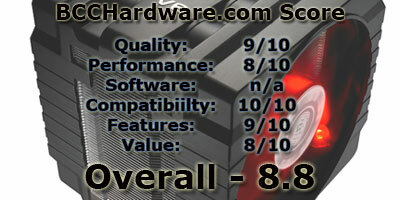 Cooler Master is known for producing high quality products and the V6 GT is no different. Overall we were happy with the performance of the V6 GT in our testing. At full fan speeds the V6 GT puts up some pretty decent performance numbers, but running the fans at full speed does produce a fair amount of noise and chances are good you probably won't want to leave the fans running at full speed. Even at low speeds the V6 GT was easily able to keep up with our 140 Watt CPU and still offer a decent improvement in cooling over a stock cooling solution. At the end of the day the Cooler Master V6 GT is a good choice if you are looking for a CPU cooler that looks good and performs just as well. 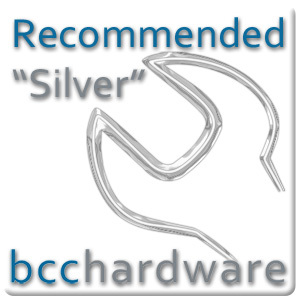 While the V6 GT fell just short of our Gold award it was still worthy of our "Editor's Choice - Silver" award and is a good value for a good cooler. I'd like to thank Cooler Master for sending us the V6 GT. If you have any questions, comments, or general feedback, please leave it at the "Comments" link below.